in The Church of Jesus Christ of Latter-day Saints. This passport-themed night will make it all the more memorable! 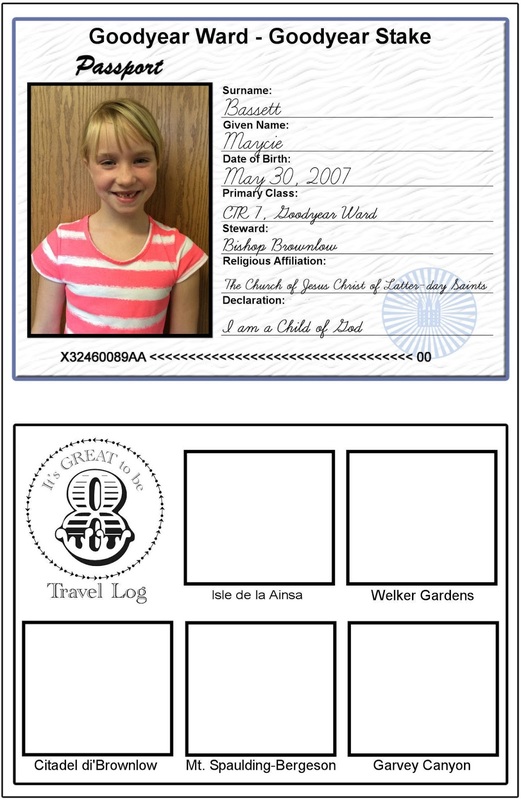 While listening to a talk about the importance passports when traveling, the Primary president in our ward (church group) came up with this idea to have a passport-themed night for the children turning 8 years old. Since I am the Sunday school teacher for that age group, I was happy to help put it together. 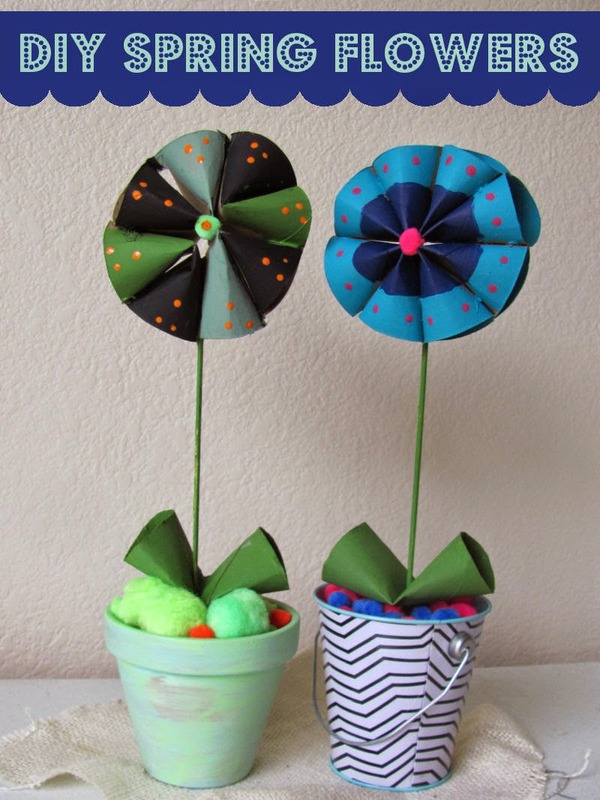 I started by scouring Pinterest for ideas (check out my board here). I also took a picture of each student to put on their "passport". 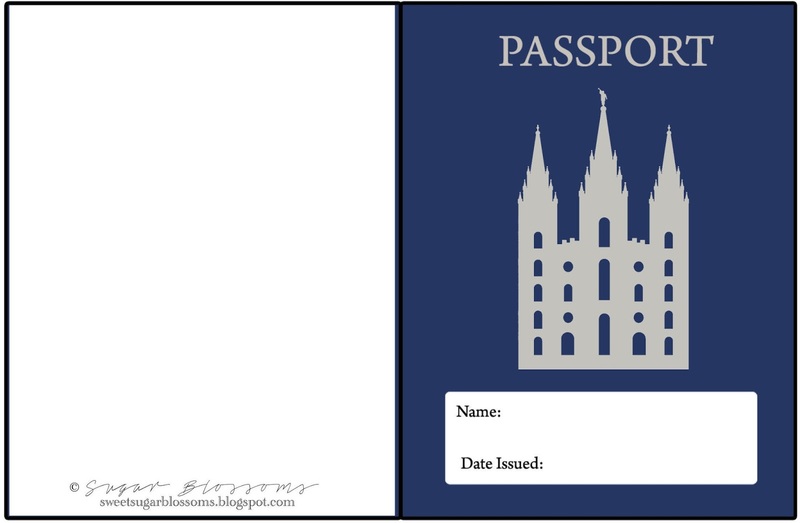 I found a passport graphic online (no source) and just tweaked it for our purposes. We had them printed double-sided at a UPS store. 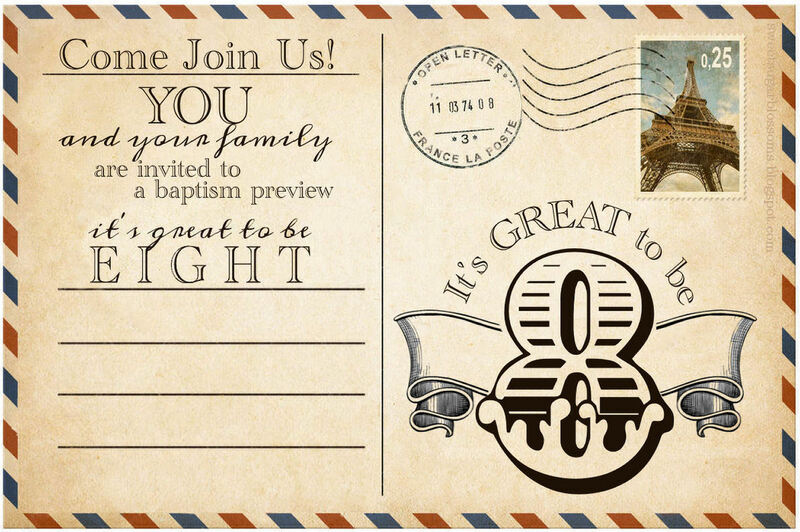 I made these postcard invitations and had 4x6's printed at WalMart.com's one-hour photo. You'll find a blank PDF version HERE that you can use to put your own info on the lines. The fonts I used are Academy Engraved and Meddon. 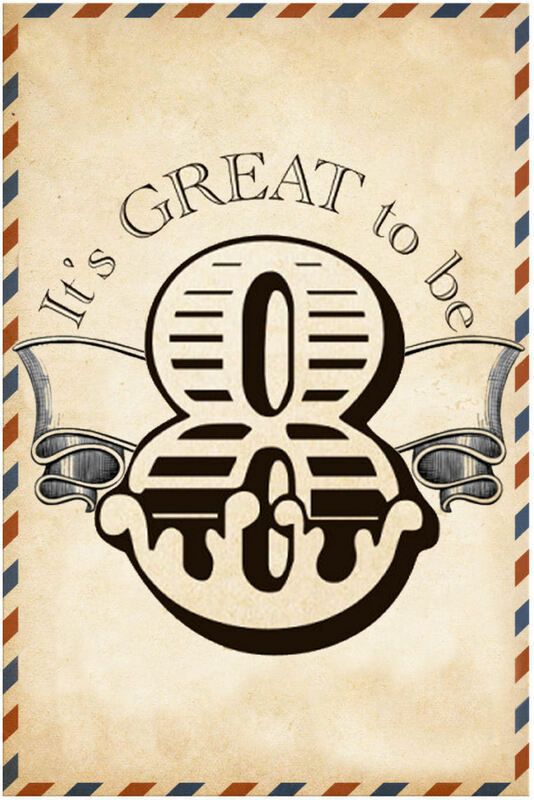 The font for the giant number 8 is called Cast Iron. We used old-world décor: trunks, maps, globes, pillars, etc. to decorate the room. I basically packed up my house and brought it to church! We set up a table outside the main room for the programs and personalized passports. I made 5 banners with my Silhouette Cameo. Since a silhouette will cut any font, I use wingding fonts to create banners. The "WELCOME" banner is made from KG A Little Swag font with Cast Iron letters. I backed them with some world map paper I found at my local JoAnn store. The other banners are made with the KG Flavor And Frames Four font's lower case "e" since it's represented by a pennant. I put 2 pennants per 12x12 page, one pointing up and one pointing down. I taped jute to the back to string them up. We covered the chalkboards with navy material to hide the stuff behind it without taking it down. I taped together the small side triangles that were left to make pennants for the banners to decorate the tables we used for refreshments. I made a cupcake topper to match the postcard and program. where the children could get their passports stamped. 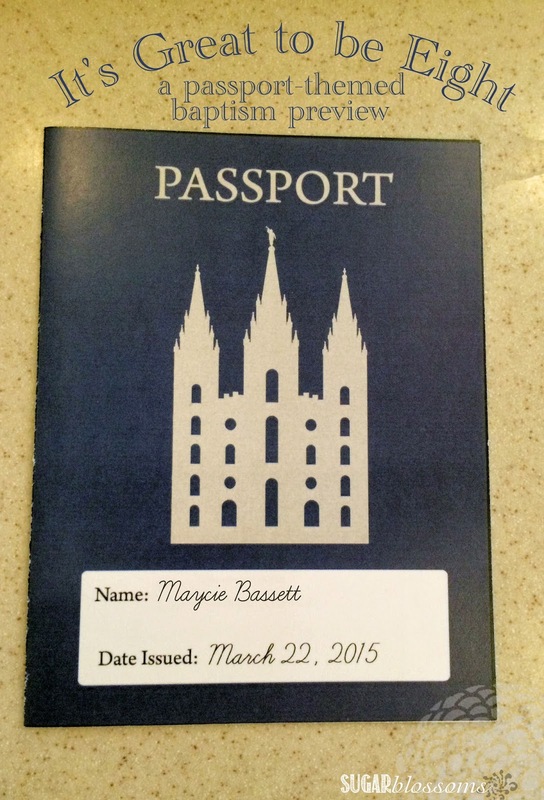 My bestie, Brit (also in the Primary presidency) has TONS of stamps from Close to My Heart. We went through them and chose stamps that we thought represented the topic of the 5 speakers for the evening. After each speaker finished their talk, the children lined up at the stamp station for Brit to stamp their passport. and then earned each stamp in their passport. When I went visiting teaching this month, I shared a message from President Dieter F. Uchtdorf about patience. 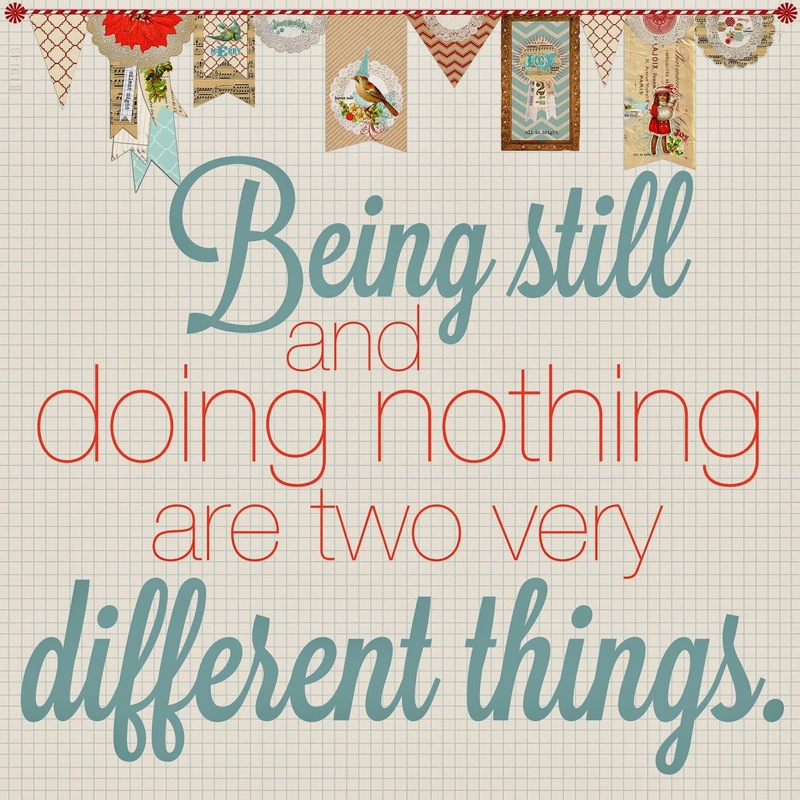 He said, “Patience is not passive resignation, nor is it failing to act because of our fears. Patience means active waiting and enduring. It means staying with something and doing all that we can—working, hoping, and exercising faith; bearing hardship with fortitude, even when the desires of our hearts are delayed. It reminded me of a profound statement I heard in a movie once. 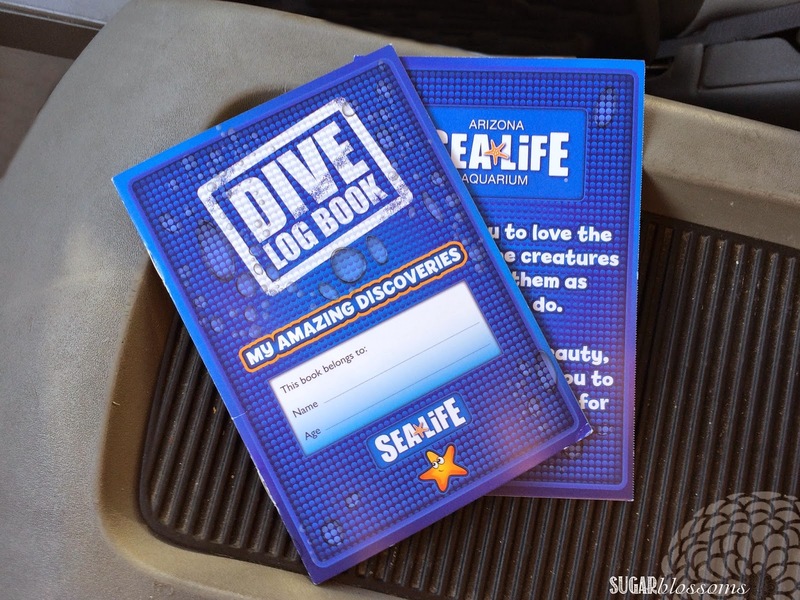 My boys and I loved every minute of our latest adventure at SEA*LIFE Aquarium! We visited the new Octopus Hideout. my Big Guy and my Little Dude had a blast! 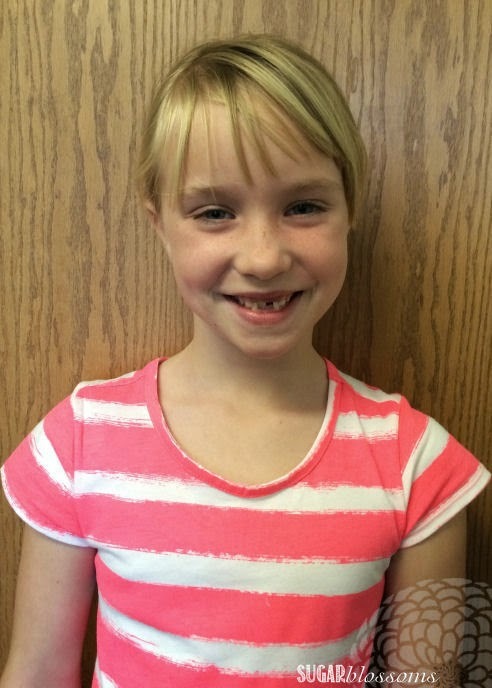 We were greeted by smiling faces and given scuba masks and passports for stamps. creatures we never even knew existed. Everywhere we turned there was something beautiful or wondrous or new. I always find it so peaceful there. The passports were so fun for my boys! Numbered stamp stations are located throughout the aquarium like a treasure hunt. The boys were rewarded for filling out their "passport" with a SEA*LIFE medal! The highlight of our visit was the new Octopus Hideout. 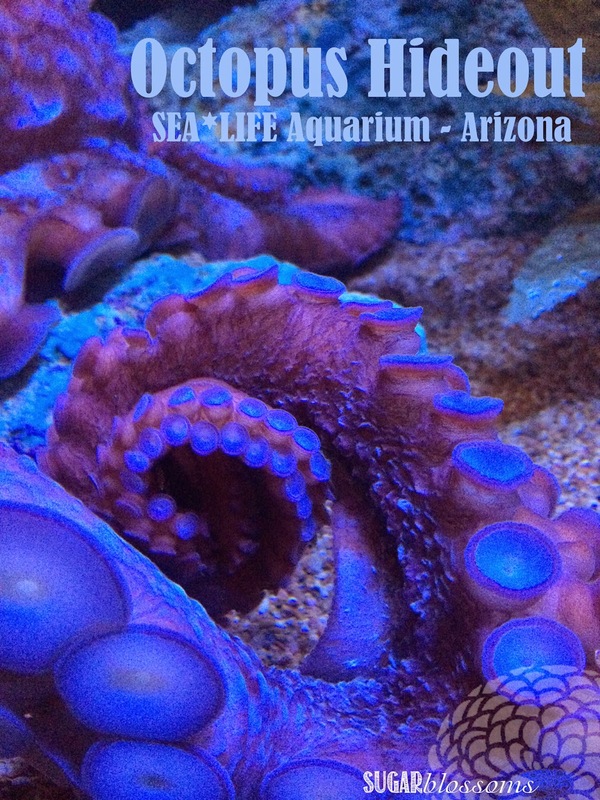 Loki, the Giant Pacific Octopus, has a beautiful new home. I would totally take her home! We watched her for a long time! changed colors form her brilliant red to near white and hid in a corner. My boys always love going to the SEA*LIFE Aquarium! There's a little something for everyone, no matter the age. 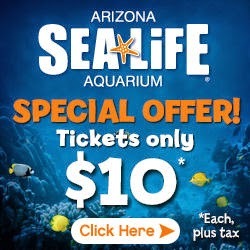 SEA*LIFE is offering Sugar Blossoms readers a discount on tickets. will be on display at SEA*LIFE Arizona through the rest of 2015. Say 'hi' to Loki for us! 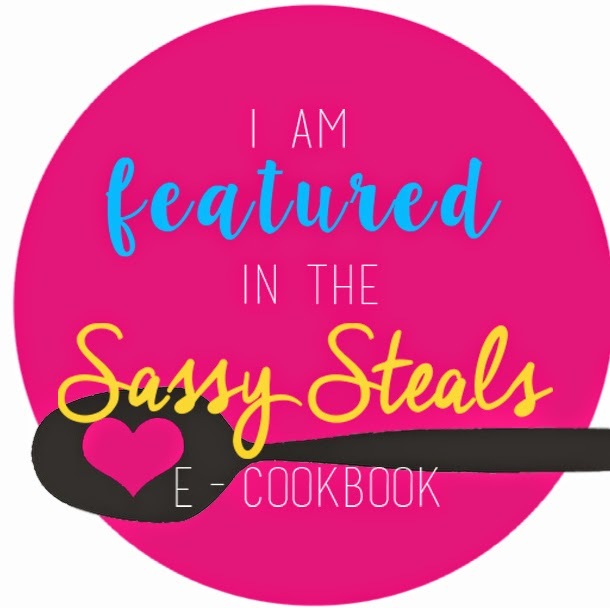 in a FREE downloadable cookbook from Sassy Steals!! My post for East Valley Mom Guide is live! Check out the simple tutorial HERE! 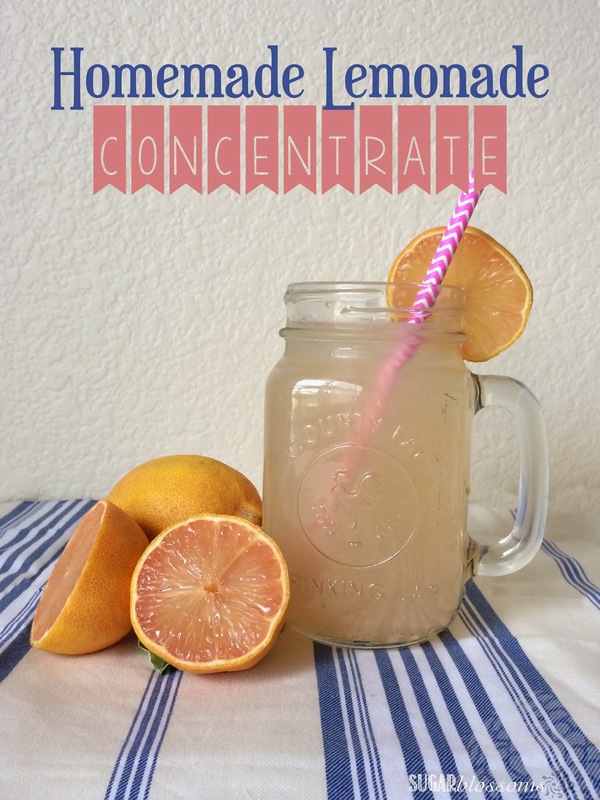 This homemade lemonade concentrate will let you have fresh lemonade year-round. We recently transplanted our citrus trees and harvested them in the process. This is the first year we've been able to do so. Our lemon tree outdid itself! 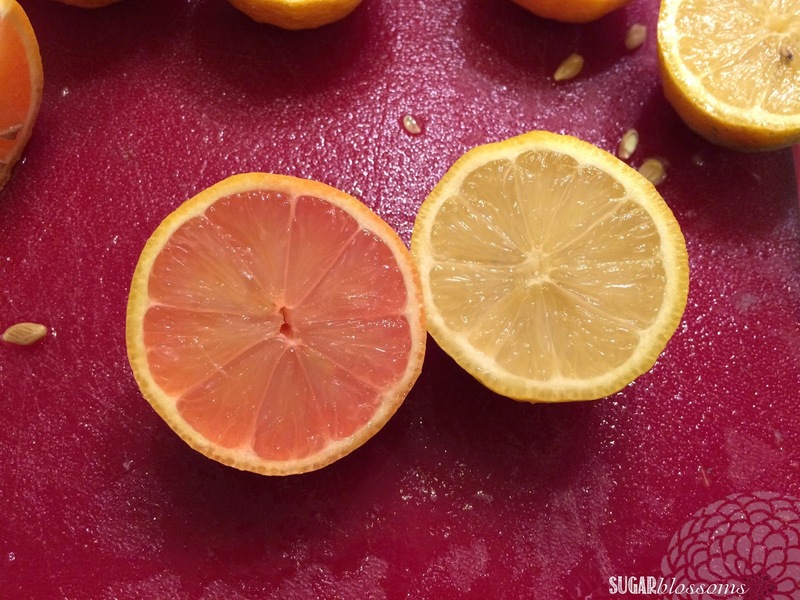 We noticed that the lemons looked like they had pink-ish stripes. One of them was actually yellow but the rest were pink. We learned that we have a Eureka Pink Lemonade tree. so we usually don't get to enjoy this refreshment often. and quickly had more than 64 oz of freshly squeezed lemon juice. 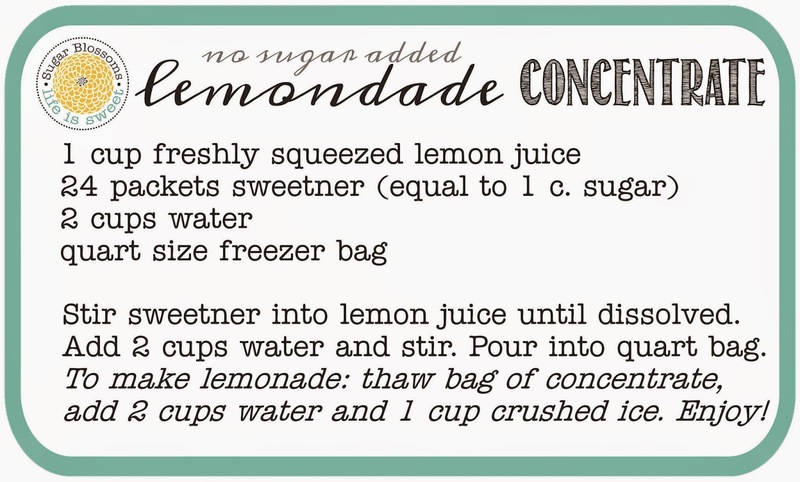 no-sugar-added recipe for lemonade concentrate. 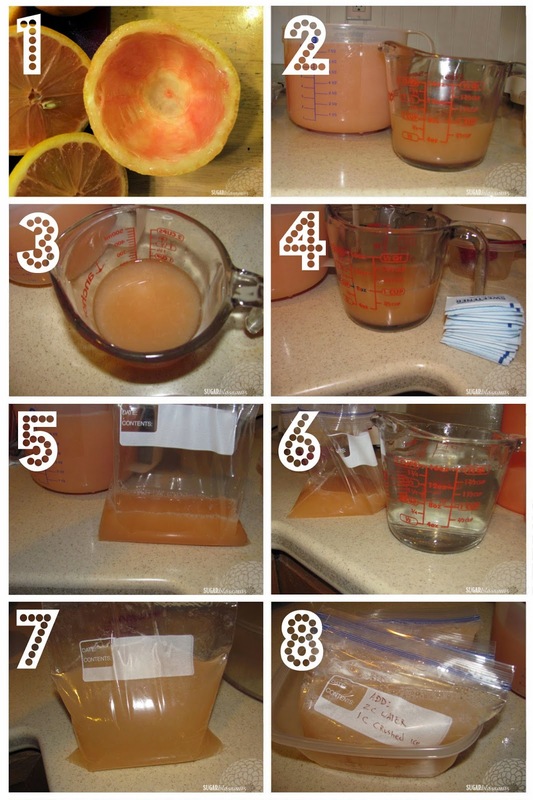 simply thaw out a bag of concentrate, add water and ice. The quilt options range from lap size to king size using 8x8 to 14x14 inch panels. They walk you through the entire process from preparation to shipping. I opted for a lap quilt which required 16 panels. It isn't required to cut apart all your shirts, only if there's a front and back graphic. to save on shipping costs when sending them to the company. It took 12 days from my sending the shirts to receiving my new quilt. I got to choose the backing color, which is a nice option. My quilt is made from t-shirts I had in college, one made for me by my littlest sister. Some of them are shirts that my boys have worn on difficult treks. Some have traveled to far away places and back home again. 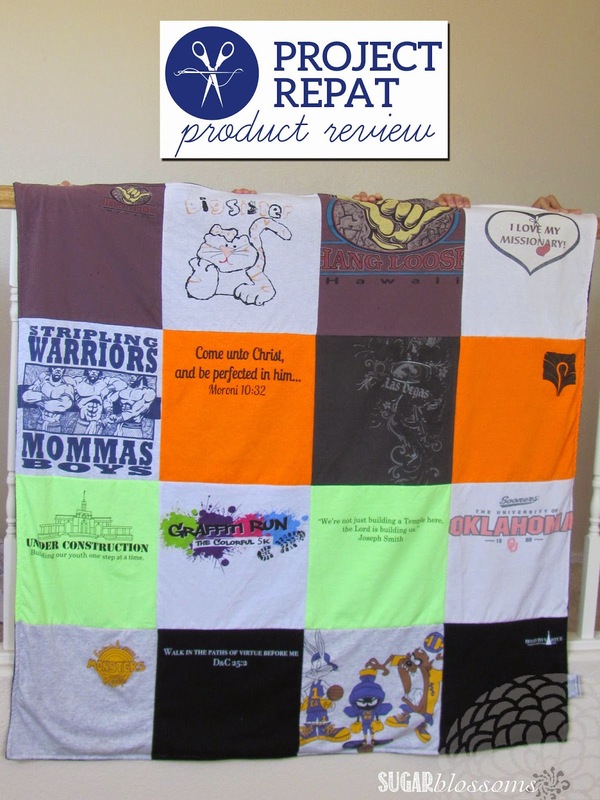 with a t-shirt quilt from Project Repat.